Is Councilmember Sherwood getting desperate? It has been 17 years and 140 days since the city’s pledge to build the West Branch Library. For the first time ever at the May 26, 2015 city council meeting the council will vote to set a recall election date of November 3, 2015. Councilmember Sherwood has got to be desperate. From the number of Sahuaro district registered voters willing and eager to sign a petition calling for his recall is a pretty clear indicator that he cannot win. In an article written by Darrel Jackson entitled Sherwood faces recall, Sherwood states, “I’m very proud of my record and I have extended an inordinate amount of energy hoping to cover for the lack of leadership that has existed with my fellow policy makers these nearly past two and a half past years.” If I were the mayor or his fellow councilmembers I would be quite angry with Sherwood’s trashing of their performance. This is one seemingly arrogant fellow believing that he is Superman saving Glendale from 6 Jesters. Sherwood in the Jackson article goes on to say , “he helped negotiate an agreement with the tribe (Tohono O’odham) worth more than $26 million for Glendale over 20 years.” He shouldn’t be quite so proud of that fact. That very same land had it not become a reservation and had been privately developed as offices, would have generated an estimated $4 to $5 million a year in various taxes. Since when is a little over a million dollars a year better than 4 or 5 million dollars a year? Sherwood’s commentary in the Jackson article demonstrates that when Sherwood is backed into a corner, it seems he can be quite vicious as he blames the current council for the resignation of former City Manager Brenda Fischer (his buddy) and Assistant City Manager Julie Frisoni (another buddy). The current rumor is that Sherwood has hired Julie Frisoni’s new consulting firm as his campaign consultant. That shouldn’t surprise anyone as it appears that Sherwood met often with Frisoni on city business that met his agenda. We can add Frisoni to the list of supporters that appear to include the Glendale Fire Union, Mark Becker of Becker Billboards and Jason Rose of the Rose Law Group. Look for Sherwood and his supporters to file something to delay the election before the council May 26th meeting and vote. How creative can they be? I expect we’ll find out shortly. It seems that Glendale’s City Clerk, Pam Hanna, is stressed this holiday season. Today, December 19, 2014 was the day of submission of recall petitions for Glendale Councilmember Gary Sherwood by the Recall Councilman Gary Sherwood Committee. In her usual fashion Ms. Hanna made yet another election mistake. She formally notified everyone that the requisite number of petition signatures required was 3,851. Oops…wrong. The actual number of signatures required is 2,752. Apparently basic math is not her strong suit. Ms. Hanna made the rounds of visiting every councilmember in person with her mea culpa. 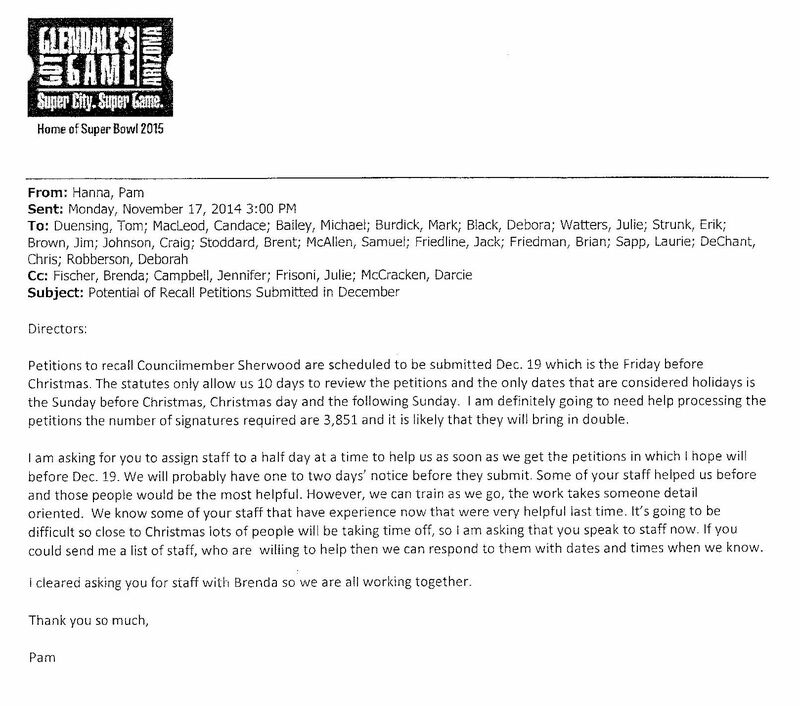 She also sent out an SOS to all city departments asking for help to process the signatures. Here is her plea for help: How many signatures were turned in? The recall committee prior to their submittal counted 404 petition sheets. At 15 signatures per sheet the maximum total could be as high as 6,030 signatures. The City Clerk’s office counted 398 sheets x 15 signatures per sheet for a possible high total of 5,970. There’s that pesky math again. No matter. Whether it’s a possible 6,030 or 5,970 signatures turned in that is far more than the 2,752 signatures required. In Sherwood’s run for council in 2012 he captured 1,615 votes. The total number of votes for all Sahuaro city council candidates totaled 4,005. No matter what the final signature tally is it is clear that twice the number of registered voters signed the recall petition than voted for Sherwood in 2012 and they will be valid signatures. There is no doubt that the City of Glendale will be scheduling a recall election in 2015. This recall effort is only one of the problems Sherwood faces. He ended his campaign with a balance of $1,330.51 on hand. In terms of running a recall campaign that amount will hardly do. It should also be noted of the $19,000 from his last campaign he loaned his campaign $8600 or nearly half of the money he raised. He may find it very difficult to obtain campaign funding this time around. 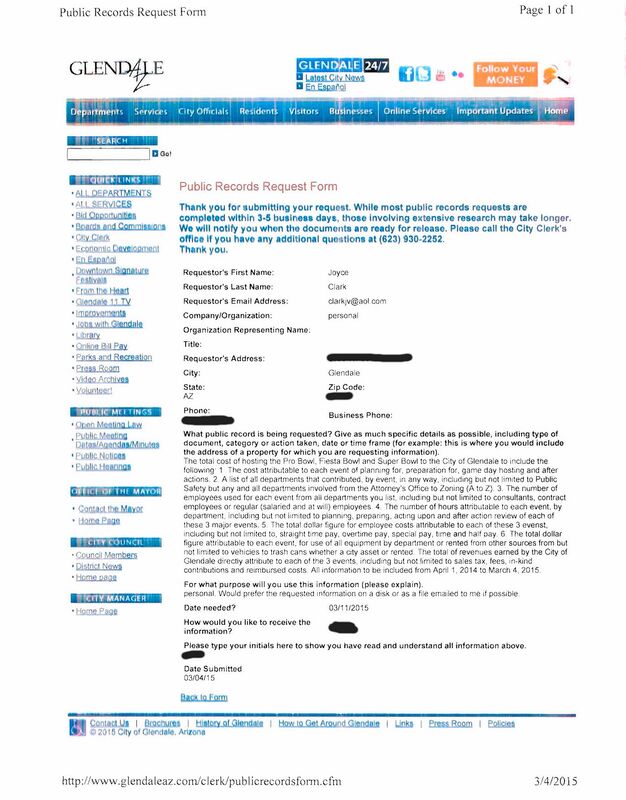 It should also be noted that on 8/29/2014 his campaign paid $380 as a fine for his not signing the campaign finance report he submitted on 6/302014. He still remains under investigation by the Arizona Attorney General’s office for alleged allegations of Open Meeting Law violations. His track record of following through on his campaign pledges has alienated him from his constituents. He ran in opposition to the proposed casino and then was the swing vote to support it. He opposed making the temporary sales tax permanent and then supported it as a councilmember. Perhaps the issue that angered his constituency the most was his ardent advocacy of the Becker billboard proposal. He attempted to push it through not once but twice. It is time for Mr. Sherwood to cut his losses and resign while his reputation is still fairly intact. FAIR USE NOTICE: This site contains copyrighted material the use of which is in accordance with Title 17 U.S. C., Section 107. The material on this site is distributed without profit to those who have not always been specifically authorized by the copyright owner. We are making such material available in our efforts to advance understanding of environmental, political, human rights, economic, democratic, scientific and social justice issues, etc. We believe this constitutes a ‘fair use’ of any such copyrighted material as provided for in Section 107 of the US Copyright Law and who have expressed a prior interest in receiving the included information for research and educational purposes. For more information go to http://www.law.cornell.edu/uscode/17/107.shtml. If you wish to use copyrighted material from this site for purposes of your own that go beyond ‘fair use,’ you must obtain permission from the copyright owner.